As a longtime fan of Homestar Runner, I was really excited to see how Ray’s version of the characters would turn out, but somewhere along the line I realized we had eliminated all Homestar characters from the script! I still love the comic as it’s much better than the original idea I had (more about that in our next podcast). It’s probably my favorite since at least Patapon and the Professor back to back. For those not in the know, Telltale Games, creators of the acclaimed Sam & Max episodic games, is now working on a Homestar Runner title for WiiWare called Strong Bad’s Cool Game For Attractive People. Weren’t you wondered how that made Sam & Max feel? I don’t consider myself a huge fan of Homestar Runner, but I consider myself at least a fan since I’m still subscribed to its podcast feed. I was trying so hard to fit “where my lazers at?” somewhere in this comic, but it never quite worked out. It’s one of my favorite Homestar Runner cartoons, probably because it parodies everything that’s wrong with amateur flash animations. I….Don’t get it. Sorry guys ^_^; …….But I really like playing Trogdor on Guitar Hero II, does that count for anything? 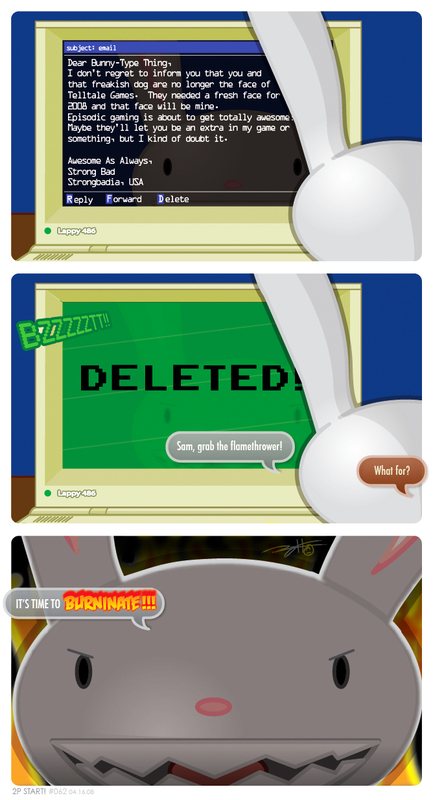 *Edit*: After looking up Burninate and realizing it’s related to Trogdor, the comic is pretty funny. Guess it would be funnier if I was a fan of Homestar Runner/Strong Bad. Well, whatever dj says, I still give it five stars and a NCG. i Must be the only one that get this joke then? I think a better strongbad reference would have been to have Sam be “the cheat” and maybe even draw him. But either way this comic rocks! Having knowledge of both is required for the humour to appear. Fortunately, I fit that category and loved it. Comics like these won’t appeal to everyone, but its great for the ones that get it. I have watched several strong bad emails and vaguely know what the bunny and dog thing is. I got the comic though – it was really funny! (love the Lappy 486 that he’s using). btw awful news! everyone follow this link and comment. i also know the author in real life. me and my freinds are now not acknowlaging his existance. @Tristan: Commenting has been closed on it sadly. That’s a really stupid thing of him to say “The Wii isn’t a “pure” gaming console because of lack of a “real” controller.” Yeah, I guess that’s what everyone was saying when Nintendo brought out that one control a long time ago with the….you know….D-pad!!! And when Nintendo brought out the joystick with the N64. I don’t get this one either guys. I should really get back into the whole gaming scene before I read anymore of your comics. The comics are obviously funny it’s just my ignorance ruining ur topical humour. Weren’t you wondered how that made Sam & Max feel? Dont’ worry, I don’t really get it either. I don’t think Homestar Runner really has much to do with games though, and Sam & Max is a PC game that I also now nothing about(aside from the two characters). So yeah……..this ones kind of obscure. Maybe Tim & Ray are going through a “let’s use stuff from obscure games(Ikaruga)/stuff(Homestar Runner) so that everybody doesn’t get it” phase. Telltale is releasing both sam and Max for Wii and “Strong Bad’s Cool Game for Attractive People” for WiiWare. Two episodic games for wii. Of course, you kinda had to have read that news for this to be funny. ok update the whole delemma i mentioned above has now been resolved. Maybe Tim & Ray are going through a “let’s use stuff from obscure games(Ikaruga)/stuff(Homestar Runner) so that everybody doesn’t get it” phase. And I love them for it. While its true that it alienates some readers, being able to get away with more obscure jokes like this is part of the beauty of the internet. Since its online it is able to reach the crowd that will be able to appreciate it. Besides, both Sam & Max and Homestar runner aren’t really all that obscure (especially HR), and with both of them having episodic games coming out from the same company, it made sense to include the two in a joke. Besides, 2P Start’s comics always have this feeling of that its more about what Tim + Ray thought would be funny, and less about appealing to any particular people. In the end, they have achieved a fanbase that appreciates this. yeah, all the mid-core 2pStart fans like dj123 just don’t get it. NCG! While I didn’t get the joke until later, it got me to look up this “Homestar Runner” thing on YouTube, and I think I may have gotten an addiction or something. 😉 So thanks, guys! Genius. Thanks for the weekly laugh. @Andrew: Don’t hate cause I’m having a good time playing online. @Baka: Yeah, I guess you’re right. But still, being one of the people who doesn’t get the comic isn’t a good situation to be in. It’s one thing if I don’t find the comic funny, but for the comic to be so obscure that not many people will have the prior knowledge to understand where the joke comes from is a different thing entirely. Especially considering that the majority of the rest of the comics haven’t been geared towards a specific group of people or as obscure, so to start doing it now(not that I’m suggesting that that’s Tim and/or Ray’s plan for the comic) would only alienate the fans that have already become loyal readers. And what the heck is Black n White’s avatar? It looks like a horse’s nostrils. Or some kind of Lamb/Sheep creature. Sorry, but I’ve been staring at it while I was writing this comment. As for Strongbad, I occasionly watch the e-mails, and know what they’re all about. So yeah… hilarious. PS: Third Panel = Wallpaper of Awesome. Yeah, it is a horse’s nostril/face, with bridle and all. It’s one thing if I don’t find the comic funny, but for the comic to be so obscure that not many people will have the prior knowledge to understand where the joke comes from is a different thing entirely. Don’t blame him, the internet happened when DJ wasn’t looking. EDIT: Sweet an editing option good job guys! wow we get profiles now yay! @Everybodies: I guess it’s my bad then ^_^; , but I had never even heard of Homestar Runner until I looked up Trogdor. I guess I’ve been playing online too much. You know what that’s like, right Andrew ? And I refuse wagons!! Especially those of the musical variety. Would have been better without the third panel. I guess I’ve been playing online too much. You know what that’s like, right Andrew ? Oh, how you mock me. Just FYI, I believe the the DELETED! screen is the wrong one. The lappy DELETED screen is blue. Actually, there was no deleted screen for the Lappy until after the release of this comic. You are correct. I knew this, but the screen we went with is more commonly known and was used more often than the current one. Besides, this is Max’s computer, maybe he’s got a different setup! DJ75728 Was raised by a cup of coffee! Loved this comic, can you make more like this? WEEE-OOO I AM DUDUMAN56’S ALTER EGO THE INCONSISTENCY POLICE! THE HOMESTAR RUNNER UNIVERSE TAKES PLACE IN FREE COUNTRY USA! STRONG BADIA IS JUST AN EMPTY LOT WITH A TIRE, FENCE, STOP SIGN, AND CINDERBLOCK IN IT! What? How did that happen??? Who did that? Oh well, sorry about whoever did that. but I did notice something… the Lappy’s DELETED! screen is actually red with an explosion and has a devil version of the Female Lappy on it. Oh, and it says deleted.